The older I get the harder drop offs at the airport get. I never realized it would get harder the older I get. But, my parents flew to visit and they were here for 4 1/2 days. It was an amazing trip! They got in around 12. We went to lunch and then headed to my house and the store for a few things before bringing them to their hotel. We hung out and the youngest swam for a little bit before we headed to dinner a little bit later. 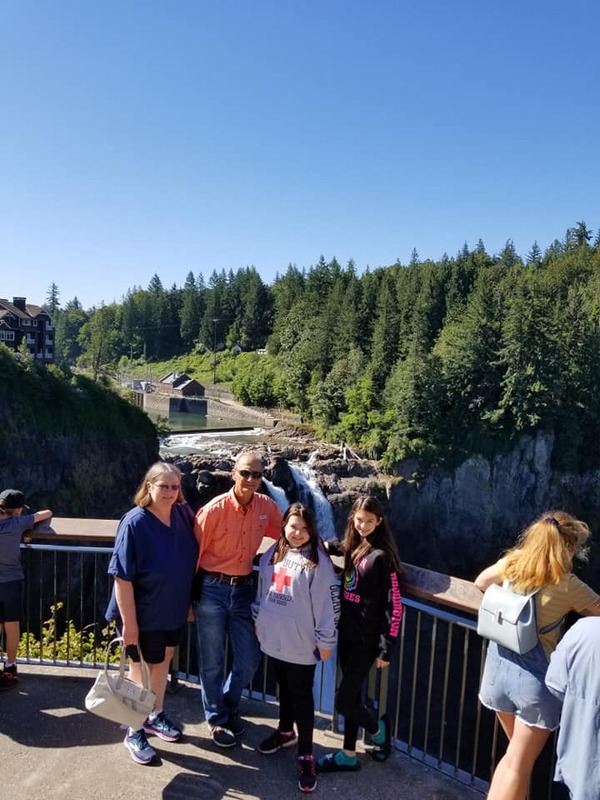 We headed to Snoqualmie Falls. I have lived in Washington state since 1999 and the first time I visited this was when my brother was in town in April. It was so pretty. My parent's had never been so we took the trip up. Only a 40 minute drive, so not too far away. It was a lot of fun! After the falls, we grabbed lunch and headed to my house. My dad went with my husband to pick up his triathlon paperwork and I ran the roads getting stuff for our barbecue we were going to be having the following day. The girls stayed and hung out with my momma. My dad and I headed to Lakewood to watch my husband do his very first sprint triathlon. It was so fun to watch and to be there to support him. I was very proud of him! I did however forget the sunscreen so I walked away with a burn, but my husband walked away with much more. He was so excited he finished! What an accomplishment. And how fun to have my dad there to watch too! After the triathlon we went back to the house and then started preparing things for our barbecue. We had some friends coming over to visit with my parents. It was a wonderful evening. Lots of fun was had. We hung out around my house. My mom did some clothes and we just visited. For dinner we took them out to eat at Anthony's in Des Moines. We had a water view and boy was it pretty watching the sunset. This picture below was one of my favorite pictures by far. I am a daddy's girl and to see my daughter have a great relationship with him too is so special. I will cherish this picture forever. 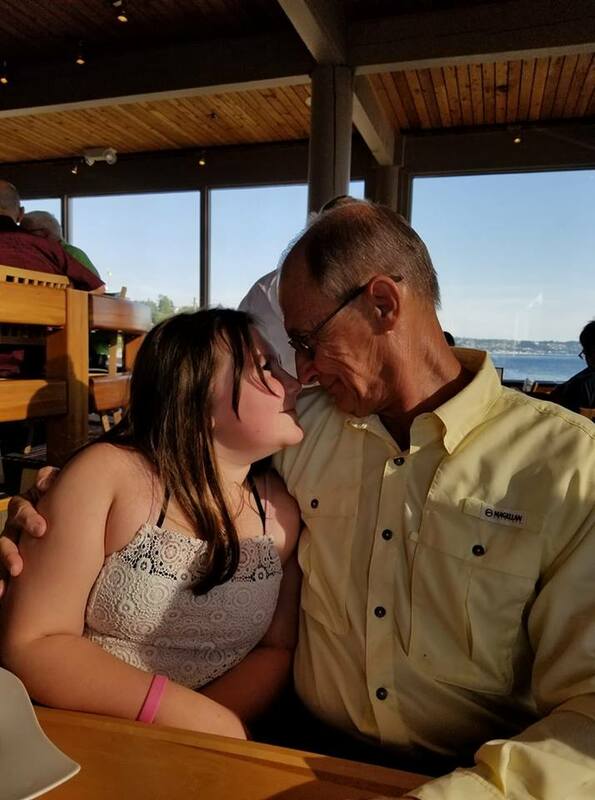 This girl loves her PawPaw. 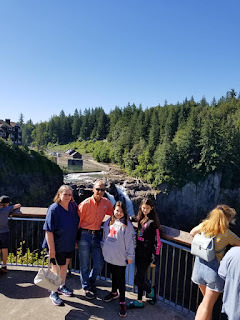 Mom wanted to go to Gig Harbor again, but we decided to try something new. We took the Ferry at Point Defiance and we headed to Vashon Island to look around. I had never been so this was truly an adventure. I didn't have a map, just GPS in case we needed help. We checked out the lighthouse there and then had lunch at the Hardware Store before heading home. What a beautiful day... The kiddo enjoyed time at the beach with her PawPaw and then we headed home. Momma cooked her famous spaghetti and we had my ex and his wife and baby come to dinner and to visit. They were picking the kiddo up so she could hang with them this week. (If she isn't with them or at the 2 camps we have planned, she is at my work all day long. NO FUN for her...) So, they had dinner and we all visited before we brought my parents back to the hotel and they left. Hi Heather! This is EricaBella from SwapBot. I'm so glad you and your family had a great vacation! I haven't taken a family vacation in a long time. Although, two years ago, my mom and I went on a bus tour to Quebec City and Montreal. That was fun! This is not Heather's blog. It is Michelle. Peanutsmommy7. Thanks so much. You should take more vacations. They are needed to refresh the soul! Or at least that is what I believe!